Food insecurity, or being without access to nutritional food, is not unheard of at campuses across the country. The Wisconsin Hope Lab found that 36 percent of students surveyed said they were food insecure in the 30 days preceding the survey. 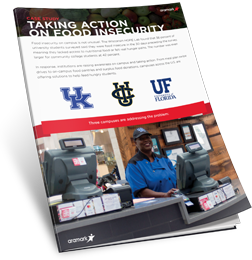 Educational institutions are now taking action to reduce food insecurity on campus through different initiatives such as swipe-exchange programs, food donations, and campus-affiliated food pantries. With the help of Aramark, three schools are tackling the issue of food insecurity on their campuses.